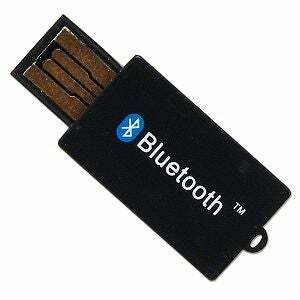 Bluetooth reminds me of this on-again, off-again girlfriend I had back in the day—let's call her Heavenleigh. When things first got hot with Heavenleigh, man, it was lovely—a feeling similar to the one I got after creating my first piconet. But the tingle wore off once the complications of the relationship became apparent: Heavenleigh had "issues", and the Sony Ericssons of the world were charging too much for Bluetooth chips. The three of us drifted apart. Then, out of nowhere, things get rekindled. In Heavenleigh's case, it was due to the combined effects of lonliness, the full moon, and enough Budweiser to fill the Caspian. As for Bluetooth, it was all about the low-ending of dongles like the Cyber-Blue unit pictured at the right. Lord knows that back when Bluetooth hit the scene, I thought I'd never live to see the day I could mod my laptop to network with my cell for under $10. Alas, if only it were so easy. 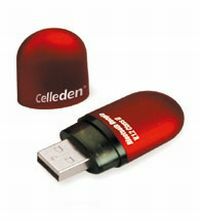 Bluetooth dongles may be plenty cheap nowadays—for the umpteenth time, thank you, Guangdong. But caveat emptor, bigtime, when wading through the dozens of no-brand options. The online dongles marketplace provides an excellent lesson in the pitfalls that await low-end consumers. A list of the vendors' crimes after the jump, as well as a manifesto of sorts regarding hype-sheet language. PLUS: An indispensable eBay rule of thumb! When shopping around for a sub-$10 Bluetooth dongle, the first thing you notice is the dearth of USB 2.0-compatible options. E-commerce sites try to be coy about the fact their dongles only work with 1.1, primarily by stressing that their products are v2.0 compliant. To someone who just wants to pull pictures off their Razr without paying $39.99 for Motorola Phone Tools, it can be pretty easy think you're getting something from the hi-speed world. And trust me, using USB 1.1 ports in a much-used version of XP has caused me all sorts of nightmares lately—enough, I'll confess, to make me start dreaming about those Intel-powered MacBook Pros. My real gripe, though, is the lack of plain-English information. Okay, I realize that this is the fabled Gizmodo and y'all are smarter than the average bear when it comes to understanding the benefits of Enhanced Data Rate. But I'm a few brain cells short of y'all, and so, too, is 98 percent of the American public. We want to geek out on this stuff—heck, even my dad finally learned how to back up his hard drive—but we're turned off by hype-sheet language that's either a) woefully uninformative as to what it all means, or b) straight-up Engrish. The bottom line is that low-end shoppers like myself want to know what we're getting into—we'll gamble on sites and deals that seem too good to be true, but you can definitely give your product a leg up with a bit more intelligent sell. When everything is priced similarly, after all, how else are we supposed to differentiate between the fruits of Guangdong? Go forth, XMicro and Kinamax, and hire yourself an unemployed English major (a demographic to which I once belonged). We'll work for peanuts and write alluring copy, as long as you don't let on to the fact that churning out Bluetooth dongle hype sheets ain't the path toward the Great American Novel. LAW OF THE GIBBERISH E-MAIL: A close pal of mine recently alerted me to the eBay auction for item number 260023191543—a brand-new MacBook Pro going for $200. He was actually thinking of making the purchase, but I reminded him of that old axiom about deals that appear too good to be true. So he e-mailed the seller, and needless to say he received one of the least encouraging responses ever—the guy actually ended with the assurance, "Please trust to purchase!" A scam, no doubt, but a mere look at the guy's e-mail address would have done the trick: hdrhghgfhgh@yahoo.com.cn. Safe to say that we can thus create a universal law of eBay usage: never buy a MacBook Pro from someone who obviously created his e-mail address by pounding his fingers on the keyboard wily-nily. For Pete's sake, he could at least have the decency to skip on over to the right side of the board and added a K or P to keep things interesting.